Candlelight Rose specializes in glass creations, stained glass, fused glass and dichroic jewelry. 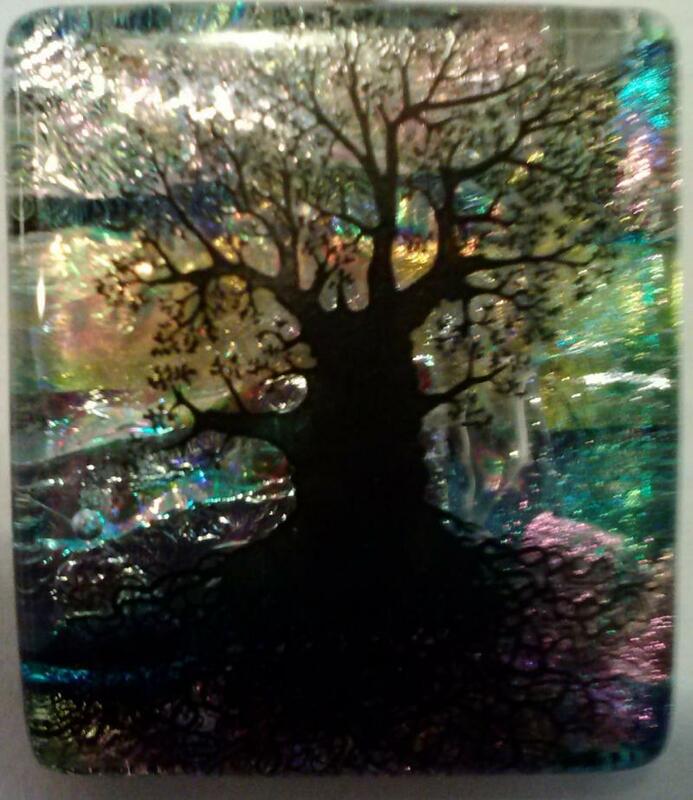 The above tree of life is a combination of multiple layers of pieces of dichroic glass and finished off with a painted tree fired to it. Dichroic glass is multiple ultra-thin layers of different metal oxides such as titanium, chromium, magnesium and silicon that are evaporated onto the surface of the glass in a vacuum chamber. Dichroic glass was developed by NASA for use in the satellite mirrors. Dichroic means "two colors" because of two or more colors that the glass reflects and transmits. The glass appears to change color when viewed from different angles or in varying degrees of light. Today dichroic glass is used extensively by glass and jewelry artists because of its fascinating beauty. We use many colors and textures of glass in the creation of our designs. Our designs are fired in kilns up to 1500 degrees to fuse the glass into brilliant and distinctive pieces. The piece is then shaped and returned to the kiln to polish it and produce an eye-catching one of a kind design. Visit our Gallery for pictures of some of my art work. Dichroic jewelry is hard to photograph and must be seen in person to be truly appreciated. We also take special orders for jewelry, key rings, and Christmas ornaments. In a sepia tone we can fuse a picture of a family member or your favorite pet to a Christmas ornament, pendant, etc. GIFT SHOP WILL BE OPEN FOR CHRISTMAS SHOPPING.... PLEASE CHECK BACK FOR THE "OPENING" ANNOUNCEMENT! Copyright 2013 Candlelight Rose of Norwich. All rights reserved.